“Your talk was an absolute triumph! Just thrilled with the subject you focused on and thank you for presenting it to us in such a matter of fact but positive style. We had a talk by a local Green Councillor last night (then had a dinner with her, staff and the headmaster afterwards!) and so much of the older children’s discussions illustrated how they had been affected by the facts you shared with us. All the younger ones that I taught yesterday also said how moved they were and now eager to learn more. Brilliant job – bravo! “My girls are big fans of yours since you came to their school. So much so they have asked me to send this – asking for a favour. ‘Dear Carrie, Following on to the amazing talk you did at our school. I would love for you to come to the Rainbows meeting on a Thursday. Its to do with plastic our meeting. Thank you I hope you do come. Your Sincerely Ellie age 10, Emma age 10, Chloe age 7′. they are helpers at the Rainbow group”. Ellie, Emma, Chloe and their Dad! “Carrie visited our school to help launch our Eco Arts Week. She delivered an assembly to pupils, staff and parents and followed this up with 2 workshops for our KS2 pupils. Her enthusiasm and engaging manner had pupils, staff and parents fully engaged for the entire 30 minutes. Carrie has clearly worked hard thinking about the content of her presentation and how best to deliver it, it was fun, educational and had real impact on the audience; we all went away thinking about our own eco-footprint and changes we could make. The workshops for pupils were also very worthwhile. Her props and interactive approach meant that pupils were engaged and learning. After the event pupils reflected on their new learning and how this would impact on them in their own lives. We now plan to set up an eco-schools group and may well call on her expertise again. “Having seen Carrie give a presentation to a local Cub pack I asked whether she could come into our school to spread the greener living message to our children! On the day Carrie started with an Energy Eco Warrior assembly to the whole school and was able to engage and enthuse children from aged 7 to 11. They were able to see the effects of our use of fossil fuels on the earth and on their futures as well as coming up with positive steps that they could take to make a small difference. During the rest of her visit, Carrie led two workshops with our Year 5 and 6 pupils. Her presentation was varied and informative and allowed children time to think, discuss and learn about the environment and our impact on it. They were inspired to make a difference in their own lives. The children were also encouraged to make links with others by putting a message onto a re-used CD that would be shared at forthcoming events – they created some lovely messages and artwork. Carrie was professional, engaging and definitely spread the green message to our children”. “Thank you so much for all your hard work and success with Green Club and also giving the opportunity for so many of our children to speak on the radio about the school special recycling fundraising scheme. It is a wonderful addition to their education, an enrichment to the School and also adding a very healthy responsibility to our children’s lives now and for the future. I have forwarded the clips to our school Governors who may not have been at assembly this morning to spread the good news, and out of what I am sure is a shared appreciation from us all”. “Carrie has been volunteering with West Sussex County Council for over 6 years, in that time, she has proven herself to be a reliable and steadfast member of the Scheme. I personally have known Carrie for over 2 years, admiring her dedication and diligence in executing her role, both as a Waste Prevention Advisor Volunteer, but also, in her passion for working with primary school children and developing their learning about the environment around them. Carrie is an excellent communicator and has much experience working with schools to improve their environmental awareness and helping to formulate action plans to achieve their ‘green’ goals”. “I am writing to let you know how much we all enjoyed your assembly. You did a terrific job and I was most impressed by your knowledge and delivery. Both the staff and girls found your message extremely interesting and hopefully the girls will have taken some of the points you made home with them”. “As part of the Billingshurst Children and Family Centre’s summer programme, we held a monster modelling madness session. All Centre activities are aimed primarily at children 0-5years of age. However, summer activities also have to be accessible, to our target children and their siblings. Sussex Green Living representative Carrie Cort came and beautifully enhanced the session. She provided excellent information on recycling, reusing items, and reducing waste to our families who attended the session. Her clear, child-friendly, and eco-friendly messaging was perfect for the mix of children and parents who attended. Great models of all kinds were made from the ‘treasure’ we had previously labelled ‘junk’. The families who attended enjoyed the use of recycled materials and were responsive to all the new ideas that Carrie provided. It was an excellent day enjoyed by all”. “I met Carrie Cort through Transition Horsham, part of the Transition Network, whose aim it is to fight against climate change, especially against the world’s dependence on oil. Carrie impressed me with her passion to make a difference by applying the green agenda to practical issues. Carrie uses her excellent interpersonal skills and character when talking to the public about the unsustainable rate at which humans are consuming natural resources and how this is contributing unnecessarily to climate change. To date Carrie has been carrying out most of this work alongside her main job at Take One and building www.SussexGreenLiving.co.uk as her night job! I wish her well with her new endeavours”. 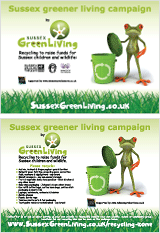 “Carrie Cort has enormous vitality and passion in promoting the cause of Sussex Green Living and as her neighbour I’m amazed to see the uses she puts to so much of the waste that we all throw away. Her single minded and fun approach in putting her message across is inspirational and we should all respect the invaluable hard work that she does to find new ways of diverting our rubbish. I am continually entertained by her 7 year old son arriving at our front door in so many guises – all made from rubbish i.e. a scarecrow, cardboard dalek, rocket etc”. “Creative, vibrant. Encouraged input from participants in development of ideas”. “Good ideas for recycling ideas”. “Really useful, went quickly. Just long enough too”. “Good fun ideas”. “Good workshop, was great to get hands on and to make something”. “Many things shared could have been found online I felt but opened my eyes to new ideas a very fun hands on session”. “So much fun and loads of ideas to take back to school”. We want you, the people of Sussex, to take some ownership of the site. Forward your suggestions for events, videos, parks and green spaces etc to be added to “your” site.